I almost can’t believe what I’m writing here. 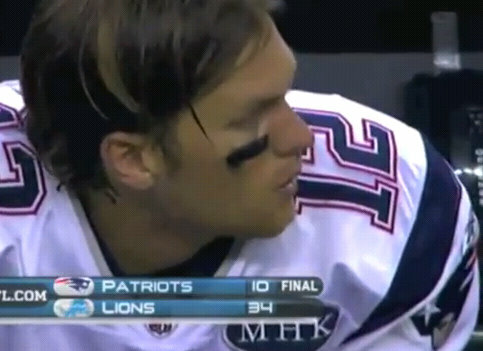 The Detroit Lions absolutely man handled the New England Patriots last night in Ford Field in Detroit. The Patriots looked like the old, crippled grandpa who struggled to make it from the recliner to the kitchen. And the Lions looked like the young, hungry team of NFL football players that were ready to make their mark in NFL history. “We have a lot of work to do. We’ve been saying it and now you see it,’’ Deion Branch said. The Patriots offense struggled from the beginning protecting Tom Brady, and things got worse after starting right guard Dan Connolly left with an ankle injury and Rich Ohrnberger was inserted who was absolutely man handled by the Detroit’s defensive line. You wouldn’t think this was a pre-season game with a majority of the starters for both teams playing well into the third quarter. Belichick had many of his starters play the majority of this pre-season game, which is unusual for the Patriot’s head coach. Matthew Stafford, Detroit’s starting quarterback, finished the game going 12 of 14 for 200 yards and two touchdowns which is impressive against the Patriots and even moreso compared to Tom Brady’s 12 of 22 attempts for 145 yards, with a touchdown and an interception.